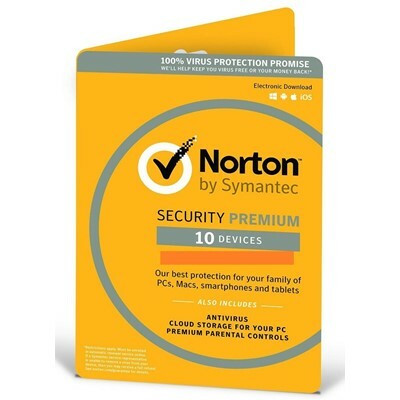 Norton Security Premium is Symantec's comprehensive all-in-one antivirus offering complete protection against all types of threats along with automatic online and local data backup. A new solution has replaced the product Norton 360. Norton Security Premium (formerly Norton Security with Backup) is a comprehensive all-in-one solution for maximum protection for all home devices, including Windows and Mac computers. One service to protect all your devices running on Windows, Mac OS X and Android, iOS mobile platforms. Provides protection against viruses, spyware, malware and other Internet attacks. Provides privacy protection, no matter what device you use. Blocks unsafe websites and prevents suspicious downloads. Allows you to transfer protection from one device to another. Allows you to add more protection if you have more devices. Easily locates lost or stolen smartphones and tablets. Automatic backup of your valuable photos, movies and files from your PC to a secure cloud storage of 25 GB. Provides enough flexibility to protect the digital life of your entire family. Key validity period begins from the moment of activation on your device! Key validity periods are not plus! If you bought several keys, the next key should be activated only after the expiration of the previous one. Spend some time, please leave your feedback on the page with the paid product! If you fail to do something, do not rush to leave a negative review. Contact us and we will help solve your problems as soon as possible.